On Monday I went and got an oil change at the Honda Service Center and also got my license plate reattached to my now scuffed up bumper. I also stopped by Tetra Tech (my former employer) to say hi to some familiar faces and see the remodel job that was done since I last visited in July. I finished up the blog post and then Victoria and I left our apartment at 3:35. Someone that Victoria works with gave her four tickets to the game on Monday and we were joined by a friend of Victoria’s (Ciara) and her fiancé (Andy). Even though our respective apartments are only a few miles apart in Madison we drove separately because they said they might have to leave early. We had agreed to meet at Friday’s Front Row Sports Grill and when Victoria and I entered Miller Park at 5:15 I almost stepped on this guy (or girl). I am fascinated with insects but I’m not an Entomologist. 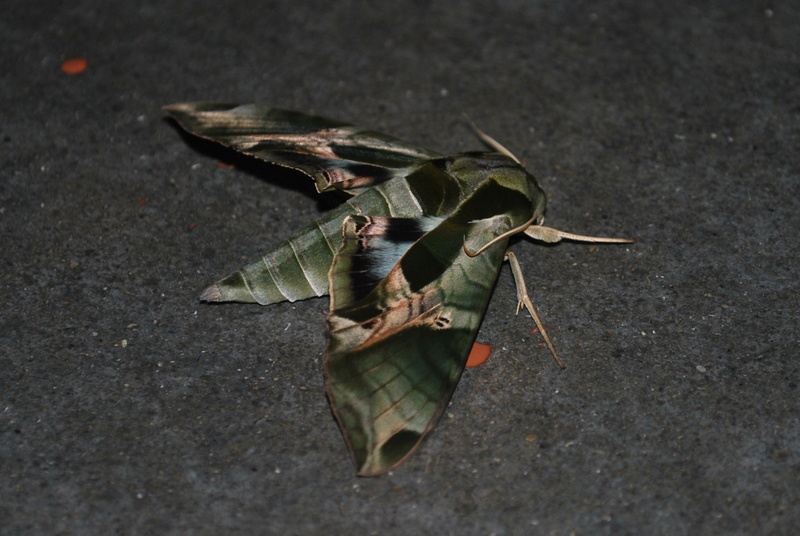 After doing a quick google search I’m confident that it is some sort of giant moth. I tried nudging it after getting the picture but it just moved its antennae a little and didn’t fly away. We had gotten to the park about 25 minutes before Ciara and Andy so I went out on the patio of Friday’s to get game photo number 160. 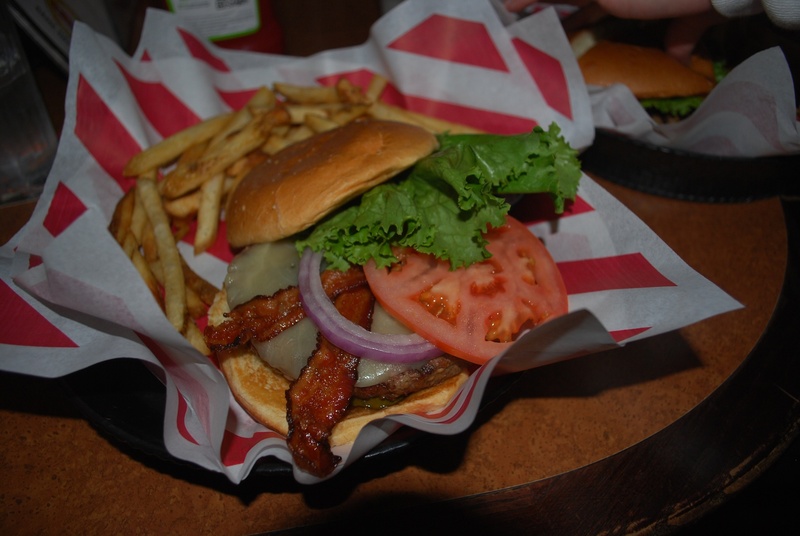 For dinner I went with the Jack Daniel’s Burger and it was very good (which probably didn’t need to be said since bacon is clearly visible). I left Friday’s at 6:30 to meet up with the brother (Tim) of a Twitter follower (Jen) who had bought my two tickets in section 221. I had left the tickets at will call but met up with Tim to chat for a few minutes and to get the $80 donation check for Be The Match. Thanks Jen and Tim! Victoria, Ciara and Andy met me in our seats in 117 and we got a picture taken before the game started. Left to right you have Andy, Ciara, Victoria and myself. Shortly thereafter Shaun Marcum threw a called strike to Everth Cabrera to get the game underway. 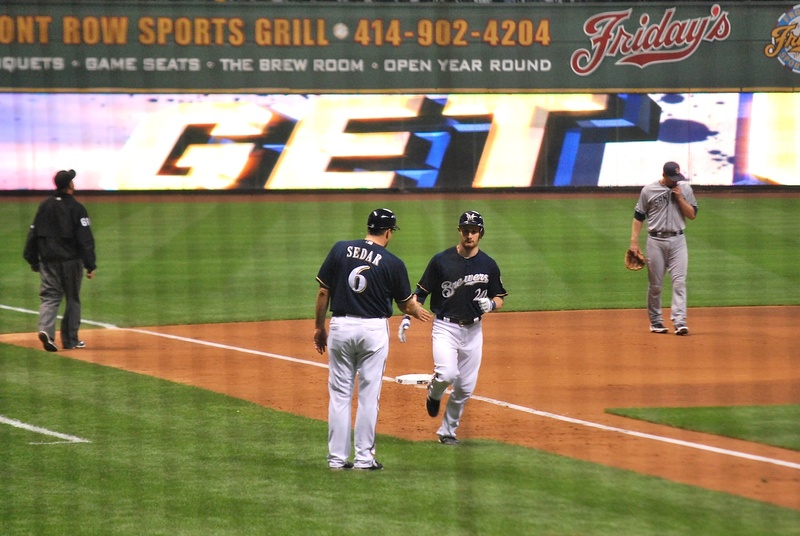 In the bottom of the 1st Braun doubled and Aramis Ramirez drove him in with a single. In the top of the 3rd inning Padres starter Clayton Richard hit his first major league home run. On consecutive days a Brewers starter gave up a first career home run to the opposing starter. It’s probably been done before but I’m guessing it’s not a very common occurrence. 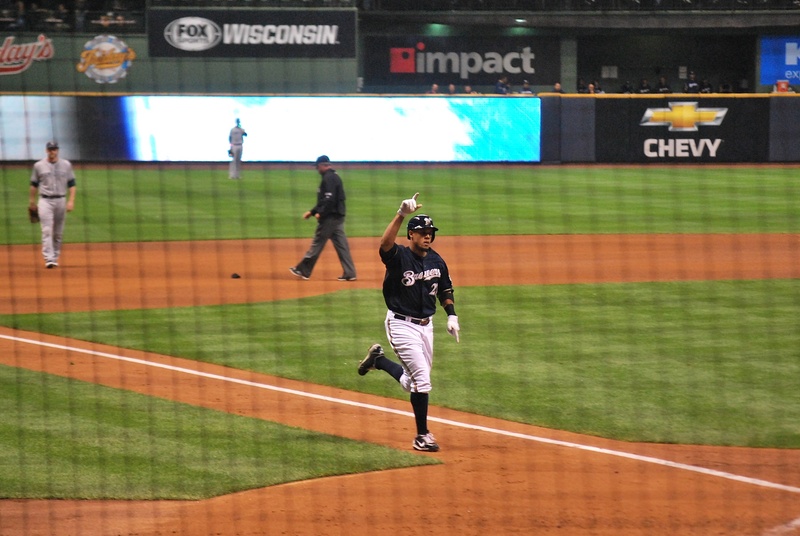 Carlos Gomez gave the lead back to the Brewers with a solo home run in the bottom of the 4th. The umpire in the background is picking something up and I’m assuming it was something that fell off of Gomez, maybe part of his elbow guard? Either that or a horse was on the field and left a gift for one of the umpires (horses don’t like bad calls). The 2-1 lead didn’t last long because 17 minutes later Rickie Weeks made contact on a full count offering from Richard. Bang!!! 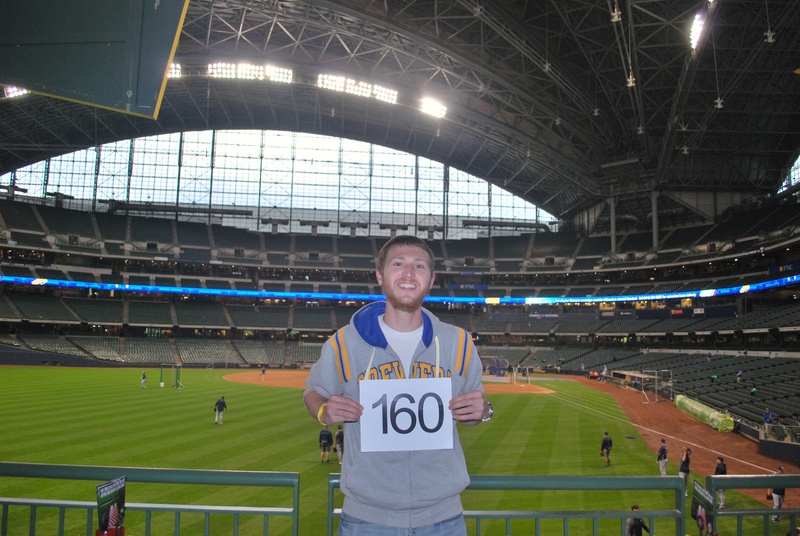 The Brewers announced it as 453 feet and hit tracker online lists it as 441 feet. Either way it was an absolute bomb. 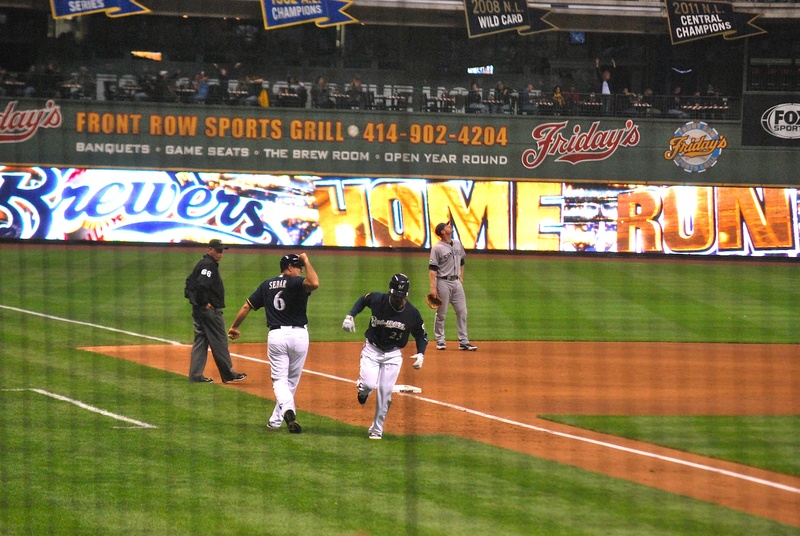 Weeks’ home run was the 200th of the season for the Brewers as a team. The friendly dimensions of Miller Park has something to do with that but they also have some very good power hitters. The Padres pulled to within 2 runs with a solo run in the 6th. 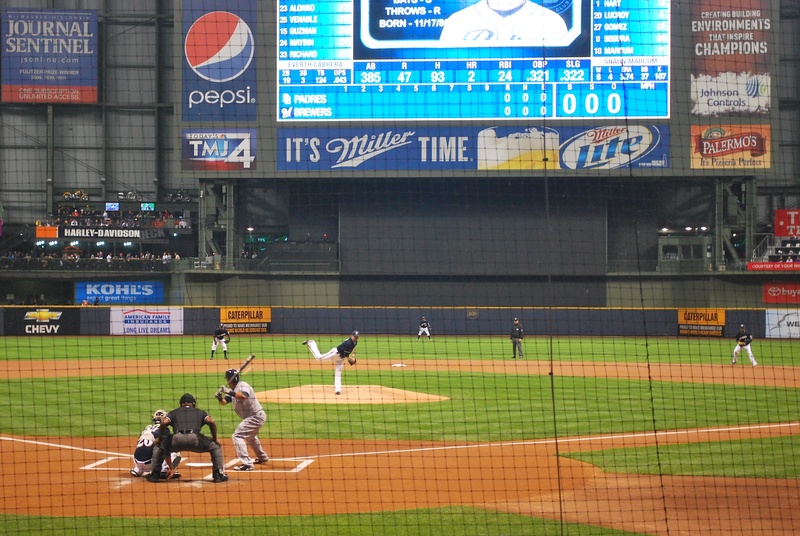 The bottom of the 6th saw the Brewers hit a home run for the 3rd consecutive inning. Lucroy put one out to left centerfield that cleared the Brewers bullpen. The Padres added a run in the 7th but that concluded the scoring. Final score: Brewers 5 – Padres 3. 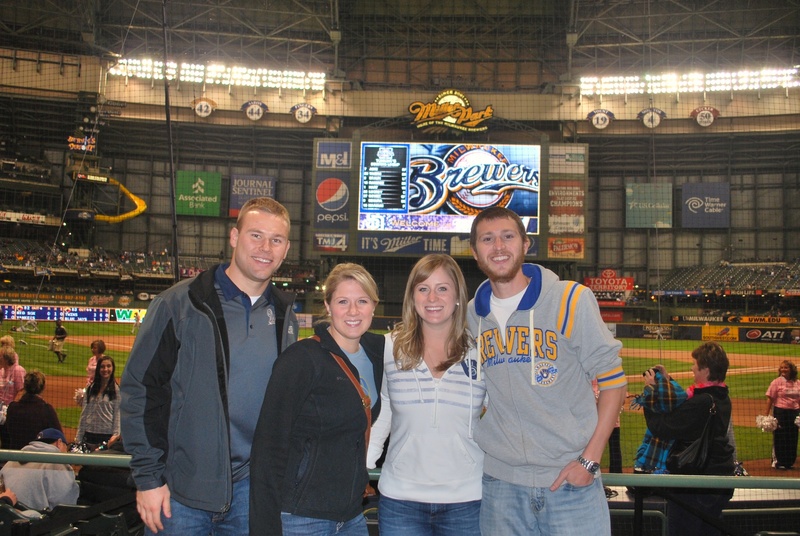 With the win the Brewers secured a winning season. While that’s not much of a consolation if you had asked me 6 weeks ago if I’d take a winning record when the Crew were 12 games under .500 on August 19th I would have jumped on that offer. 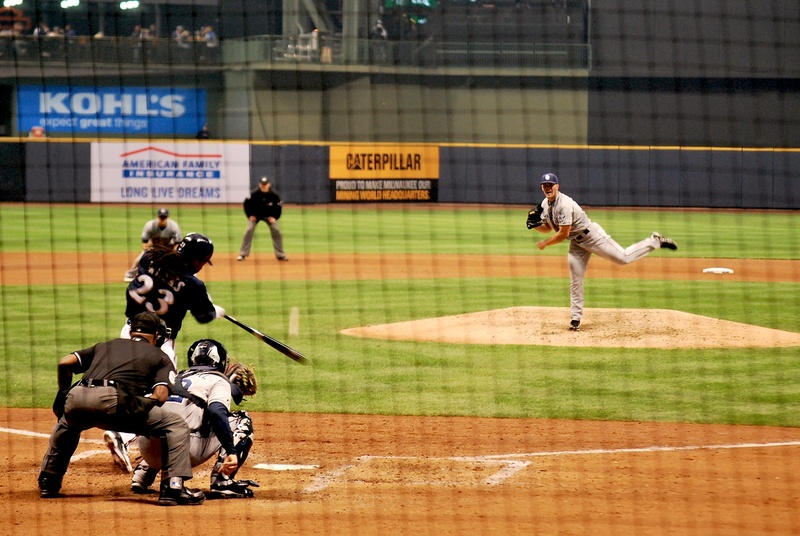 If the Brewers pitching staff can get 19 strikeouts over the final two games they’ll break the record of strikeouts as a team which is held by the 2004 Chicago Cubs. Let’s get it!!! It’s past noon on Tuesday and I’ll be leaving in a few hours for the second to last game of the year. I’m throwing out a ceremonial first pitch tonight and after being up close yesterday I may or may not be getting a little nervous. “Don’t bounce it, don’t bounce it” is being repeated in my head as 7:00 approaches. I’ll be doing an interview on FSN during the 3rd inning and I’m not sure if they’ll show the pitch. Part of me is kind of hoping they don’t in case I embarrass myself. Either way it should be an enjoyable day at the ballpark. I lived in the same dorm as Ciara…small world.